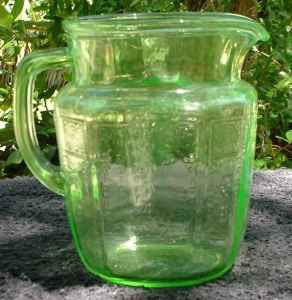 Awful Bad: DEPRESSION GLASS PITCHERS~LOW PRICES~Look! These pitchers would be ideal for Holiday Egg Nog! The economy is so bad people are having to sell their depression glass....oh irony. But seriously, who does not want their nog to look green? Labels: Decorative?, Design?, Makes a Great Gift?, Useful?